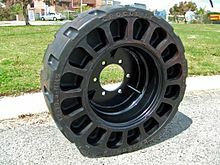 Airless tires (also called Non-pneumatic tires) are already being used on the military Humvee, therefore it should be safe for commercial use in the near future. It will not go flat if shot (by an angry mother-in-law) or hit by shrapnel (coming from a local redneck fourth of July bash). Sounds good enough to me. What about finding air at the local gas station these days? If the fine establishment even has an air pump it will usually cost a couple of quarters. Imagine those bygone days when air was free. Those were the days. Then the big question. Will ‘big rubber’ and ‘big oil’ let the airless tire come to market? 1. Revolutionary airless tire ready for consumers?